I would have been about twenty the first time I read Rumer Godden’s novel (actual quote from a friend: “You want to be a nun, and you haven’t read In This House of Brede?”), and at first I found it hard going. For one thing, there are a lot of characters. It’s easier the second time around, once you know that there are three main characters (Philippa, Cecily and Abbess Catherine) and three important secondary characters (Dames Veronica, Agnes and Maura), and that all the others are well-drawn but incidental to the story. The main reason I struggled to read Brede, though, was that the things I was reading kept striking home too sharply, as the characters’ doubts and trials became a mirror for my own. There’s a scene partway through the novel in which one of the sisters is told by the abbess that – after her future in the abbey had been hanging in the balance – she will be permitted to make temporary vows. And this character, normally so efficient, cold and practical, feels the relief so deeply that she collapses in a faint. I knew that one day, I too would wait while the Council met to decide whether or not to admit me to profession: I, who desired the religious life with my whole being, could easily imagine collapsing with relief when accepted. Or trying to hold on to a vocation in the face of the same internal and external pressures faced by another sister throughout her novitiate. Rumer Godden writes her characters intensely and unsparingly, and just as in real life, their virtues can easily tip over the edge and become flaws. Philippa Talbot is a widow who gave up a high-powered government career to enter the religious life in her forties, and her drive and acute intelligence isolate her from the other novices. Cecily Scallon is a brilliant but fragile young musician whose family opposed her entrance into religious life, and her determination sometimes hovers at the edge of selfishness. But if virtues can become flaws then the reverse is also true, and the book’s most rewarding and beautiful moments come when, by the grace of God, a character is able to turn around and gain a true victory over self. In This House of Brede is largely, as you will have gathered from my description above, a character-driven book, but character development is intricately woven through its layers of plots and sub-plots. 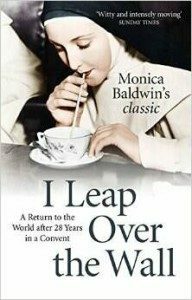 In a nutshell, it is the story of an English Benedictine monastery in the early 1960s. The old abbess dies suddenly of a stroke, and her successor Abbess Catherine inherits a catastrophic financial situation that casts doubt on the future of the monastery, as well as a religious landscape that is changing beyond recognition with the opening of the Second Vatican Council in Rome. One of the main differences between the novel and its 1975 film adaptation starring Diana Rigg is that the latter chose to leave out these aspects of the novel, and to focus on the relationships between the nuns instead. The film is quite pleasant in itself and I’ve watched it a number of times, but the source material is so complex that, by simplifying it and stripping out the sub-plots, a lot of the most profound (and dramatic!) moments of the book were lost: the tense medical emergency that threatens to shatter the lives of several characters; the slow crafting of a new chapel that mirrors the nuns’ own growth in faith; and also the scene I had most looked forward to seeing on screen, in which the abbey’s most treasured possession gives up a secret it had held for over a century. 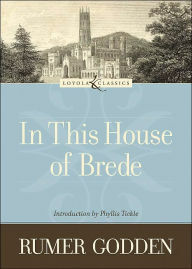 Brede really deserves an adaptation into a television series, I think, to follow the author’s carefully balanced and layered plotlines fully, and most of all to do justice to the varied, struggling, loving and movingly human women who live within the walls of the abbey a life devoted to God. Godden was a Benedictine Oblate who wrote no fewer than three novels about nuns: Black Narcissus, written in thirty years before her conversion to Catholicism, examines the psyches of troubled missionary sisters from a cold and critical distance and was, I thought, very much an outsider’s view of the religious life, while Brede, written in 1969, has more balanced and mature characters, and shows a deeper, internalised understanding of the monastic vocation. The last, 1979’s Five For Sorrow, Ten For Joy, is a much darker book (the heroine, Lise, enters the convent straight out of prison), and certainly not for the fainthearted, but it too reveals the dignity and sacrifice of the religious life and those who live it. Black Narcissus is probably the most famous of the three to a secular audience, but it is the quiet and complex Brede that has won most admiration from the religious sisters I have known. If there is any book that can lay claim to being the novel about the contemplative religious life, it is surely In This House of Brede. “There is a difference between early grief and later grief. Early grief is acute; later grief is more diffuse. Early grief smacks, stings, punches; later grief is more gentle. Early grief is a stalker; later grief is a companion. Early grief is crags and crevices; later grief is furrows softened by the passage of time” (Gregory Floyd). Each of us experiences this mysterious phenomenon of grief in our lives, to which I am certainly no stranger. In the early months after leaving the community I had discerned with, my mom, who spent many years in the field of social work, gently said to me, “I think you’re grieving. You need to let yourself grieve. To cry. To work through what has taken place. You lived a very beautiful and yet difficult life and it is a loss for you.” To which I responded, “No, I’m not. I’m fine. The Lord called me to leave and there is grace for me to transition. I’ll get through this.” Little did I realize that while there was a tremendous amount of grace, that I was in fact certainly going through the grief process, but didn’t want to admit it. A dear friend of mine passed away during my canonical year and as I was trying to make sense of it all, A Grief Unveiled was given to me. In my opinion, it is one of the best written works on grief available as it articulates the rawness of feelings and emotions one can experience as well as a magnificent integration of our Catholic beliefs to anchor and carry us through the storm of loss, whatever form it may take. As I read it again for the second time in the different context I now find myself in, I receive new insight to what often lies unable to be articulated by my heart. How grateful I am to the Floyds for writing their journey of the Cross so that others might be led to the glory of the Resurrection, the fulfillment of Calvary. It was a lazy afternoon in April, 1995, when the unthinkable happened. Six-year-old John-Paul, the youngest son of Gregory and Maureen Floyd, was playing in the front lawn with his brother David when both were struck by an out-of-control car. Rushed to separate hospitals, David survived with bruises, but John-Paul died instantly. 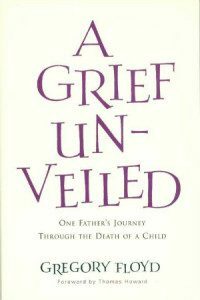 In A Grief Unveiled, Floyd reveals with painstaking candor his journey through the sorrow of losing a young child – dealing not only with his own broken heart, but also with the struggle to reconstruct his role as husband, father and protector. Unlike glossy modern libraries that boast about their Wi-Fi, iPads and e-books, the Catholic library in my city is tucked away on a mezzanine floor of a battered old building, has one old-fashioned monitor on which you can search the catalogue (when they remember to turn it on), and contains rows and rows of wonderful dusty books, many of which have faded “Date Due”stamps from a time before my parents were born. My favourite books in this library are from a genre that boomed briefly in the 1950s, heyday of religious vocations in the Church, and disappeared without a trace after Vatican II: literature designed to give young women an “inside scoop” on life in the convent. Books like Everynun by Father Daniel A. Lord, a play about a nun who inspires a doubtful postulant to remain in the convent by relating the details of her own long and rich life, and What Must I Do? by Sister Mary Paul Reilly OSB, a novel written entirely in the second person: “you”are a confident young 1950s girl named Marilyn who goes through every step of formation up to the day of final vows. The cultural references in these books are sixty years or more out of date, the slang almost painfully quaint, but the charm of them is still there. 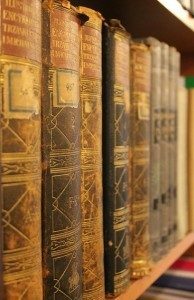 The books themselves may be products of a particular era, but the genuine love for God and for the religious life, and the desire to share that love with others, is timeless. Amata Means Beloved is the same kind of book, written for our time. The author is Sister Mary Catharine Pe rry OP, a cloistered nun who published this, her first book, in 2003. At 101 pages, it’s an easy read – I finished it in a one-hour train ride home from work – and it has the same simplicity, earnestness and sweetness as its 1950s predecessors. The story follows Emily Barone, an American in her early twenties who enters an enclosed Dominican monastery (presumably based on the author’s community in Summit, NJ), and must overcome an enormous internal struggle in order to stay. Anyone who has lived in a religious community will recognise the way that the contemplative life brings her suffering to the surface: old grief and anger that she has forced down in order to give the appearance of tranquillity force their way back up again during her novitiate, and must be dealt with if she is to remain. What exactly happened to her brother that she can’t come to terms with? 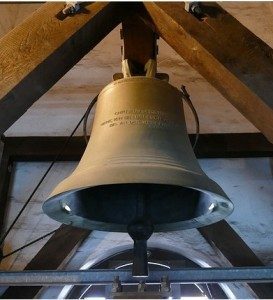 And why do cracks start appearing in Emily’s facade every time she catches sight of the community’s new bell? This novella is set in the early years of the 21st century, and clearly written in the immediate wake of 9/11 when so many lives were ended or damaged forever by terrorism. In that, A mata Means Beloved deserves a second reading: Emily’s grief process can easily be read as a metaphor for the struggle of America as a country to cope with the wounds inflicted on its soul by an unfathomable loss of innocent life. And yet, it’s a humorous and hopeful book. She is not left to battle her demons alone, but accepted and prayed for within the community – the most touching moments throughout, particularly the scene where Emily’s novice mistress explains the meaning of her new name (and thereby the book’s title), are the times when her sisters in Christ quietly reach out to her. Like the books I’ve dug up from long ago, Amata Means Beloved is stylistically a product of its time, with contemporary references and language that will eventually become dated, but its deeper themes – specifically, the ways that a religious vocation both demands and shapes the growth of personality in community life – will endure, and young women many years down the track who find a battered old copy in the library will see in it a reflection of their own uphill path to God in discerning a vocation to religious life. Strictly speaking, Father Roger points out, Cosmas was not a novice at the time his life abruptly ended. Convinced beyond doubt of his vocation, but unable to bear the difficulties of monastic life, he had left the community twice, the second time seemingly for good. Why, then, has he been laid to rest among the brothers, wearing the habit of the community? This is the force that drives de Calan’s story: the character study of a devout, sensitive and lonely young man, and the battle that he fought with himself in seeking the religious life. We know from the outset that Cosmas is dead, but it is the state of his soul and vocation at the moment of death that the reader must wait to discover. As writer Patricia Snow comments in an article entitled “Dismantling the Cross,” novels by Protestants tend to end with the neat conclusion of marriage, while “the Catholic novel, whose proper subject matter is the relationship of the individual to God, can only be finally consummated outside the bounds of the novel and even of life itself.” The ultimate moment of failure or redemption cannot be achieved during the hero’s lifetime, and so only in death can we find out whether or not his vocation was a true one. 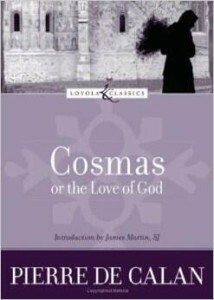 I first read Cosmas while discerning a possible call to the religious life, and donated my copy to the convent library when I entered. After borrowing it herself, the Prioress instructed all the Sisters to read it, and Cosmas made it onto the community’s short list of novels that gave an accurate impression of the religious life. (To give an indication of how short this list was, the only other book on it was In This House of Brede.) Unlike Rumer Godden’s novel, Cosmas was originally written in French, and has a self-conscious European literary approach that may seem stilted to some readers (if you have read Song at the Scaffold by Gertrud Von Le Fort, you’ll be familiar with this style), but Father Roger is a likeable and engaging narrator, and he draws the reader slowly into the story of a determined, exasperating, struggling young man who will come to fulfil his vocation, one way or the other, in the final moments of his life. Did you know there’s a film based on the life of our patroness, Leonie Martin? The founder of Holy Trinity Productions and executive producer of Leonie!, Barbara Middleton, has kindly agreed to answer our questions about the film and the woman who inspired it. What was it that first interested you about Leonie? Fr. Jacques Daley suggested I make a movie on St. Therese and in my research of St. Therese I discovered Leonie Martin. Primarily, I chose her because she’s a part of the Martin Family. Leonie’s association to her sister Therese and their close relationship drew me to her. I was struck by the difficult childhood she had and the hope she could bring to others. Can you tell us about the research you did in preparation for the film? Did you learn anything that surprised you? Discovering the house in which to film the movie Leonie! I spent the day traveling around the town of Romeo, Michigan looking for a location to film. I toured many homes in the town but one caught my eye as we drove passed it. I had visited Leonie’s home in Lisieux and this house looked like a replica of the Martin home. I had a sense of St. Therese at that moment. After all day looking at houses I asked the driver to take me back to that house. She graciously did and I was praying to St. Therese all the way back to the house. Upon entering the driveway the owner (Diane Jesmore) came out to bring her dog in. I got out of the car and introduced myself and she welcomed me into her home. I told her I wanted to make a movie on Leonie Martin, sister of Saint Therese. She was not Catholic but knew about St. Therese. They opened their home for weeks of filming and could not have been more receptive to us. Ron Jesmore had a clock collection throughout the house and Mr. Martin himself was a clock maker. They had a camera on a tri-pod identical to the one I saw in a book on St. Therese. I knew that Leonie and Therese guided me to that house. You discovered Mary Rose Maher, who plays Leonie, in a stage play two years before the beginning of filming. What were you looking for most of all in your choice of an actress for the part? My pastor gave me tickets to a stage play in Detroit at Assumption Grotto parish. Watching the play I noticed an actress and thought she’d make a good Leonie Martin. I asked Joe Maher who also was at the play, to meet with me about a project I was working on. I did not know at that time that Mary Rose was his daughter. I wanted to see if he was interested in directing the film. He was enthusiastic and excited about the project. In a unique privilege, you were permitted to film some scenes of the film in the cloister of the Visitation Monastery in Toledo. Can you tell us about filming in the monastery, and the Sisters’ response to your work? I already knew the nuns at the Visitation Monastery in Toledo, Ohio. I contacted them and asked if I could film in the enclosure of the Monastery. They told me I had to get permission from (then) Bishop Leonard P. Blair. I knew Bishop Blair (now Archbishop Blair)and he gave us his blessing on the project. I can’t begin to tell you about the joy I received filming in the cloister. The openness of the sisters was beyond words. You could hear them singing throughout the day and sometimes I would sit in the back of their chapel and enjoy the prayer time with them. They were gracious, kind and helpful throughout the filming. We invaded their quiet world and they adapted beautifully. It was such a privilege to be in their monastery. 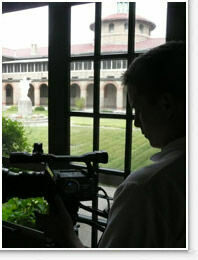 I’m told we’re the only Production Company in the US to film in a cloister. The Visitation cloister in Toledo, Ohio is breathtaking. All the doorways had verses of Saints over them. The doors had medals of Guardian angels on them. It completely leaves you in the Presence of God. Were there any moments during filming where you realized that something special was being captured? We filmed the death scene of Leonie in the infirmary. It was a moving scene and all the time we were filming a Sister in the room next door was dying. Can you describe the relationship between Leonie and St. Therese? St. Therese loved Leonie very much. Therese told Leonie after I am gone you will enter the Visitation order and persevere. Mrs. Martin’s sister, Leonie’s aunt was a Visitation nun. Even though they were cloistered they ran a school behind the Monastery which all the Martin girls attended. Three times Leonie entered the Visitation order and on the last try she persevered. St. Therese taught Leonie her little way of spiritual childhood and Leonie was faithful to it. To follow Leonie’s spiritual journey is to see the little way at work. The Visitation sisters see it as very Salesian. Leonie had m any limitations in her life. She was not an attractive figure. She was slow academically and was always sick. She suffered from eczema along with other physical ailments and was very different from her sisters. As a child she thought she has been adopted since she was so unlike the rest of the family. Therese and the other Martin sisters continually encouraged Leonie and never gave up on her. One of the nuns depicted in the film is Sister Jeanne Marguerite, who supported Leonie in her vocation. Can you tell us about this friendship and its effect on Leonie? Were there others who helped her, too? 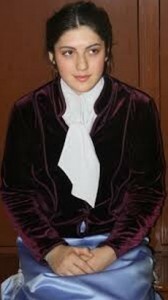 Paige Pilarski played the part in the movie on Sister Jeanne Marguerite. It is actually a composite of several superiors and the sisters of the community. Mother Jeanne Marguerite was superior when Leonie received the habit. When she heard Leonie had asked to reenter, she had no problem with it for she knew Leonie’s soul to be a very obedient one. The sisters loved Leonie and Leonie loved them. On the eve of her profession Leonie asked God to do with her as He wished and she added: Let me be good and charitable, even to excess, so that I may follow my Therese’s example in following Your new commandment. And she asked Him to act in and for her as she realized her own weakness and inability to accomplish it. 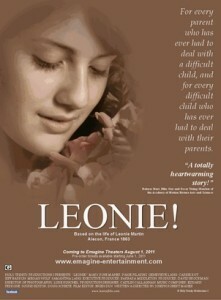 Paige had the gentleness and simplicity to capture the part perfectly, portraying the love of the community for Leonie. What can we learn from Leonie? This is a very important question! It shows that no matter how many problems we have and struggles the Lord never gives up on us. Leonie teaches us that even though she was less gifted than her sisters her struggle to be a good religious pleased Jesus tremendously. She has given hope to many people. Leonie shows what trust in God and perseverance can do. As a child she said she wanted to be a religious and she never gave up: she relied entirely on Him. All of us are called to holiness and Leonie shows there are no excuses. God will work it in us when we open ourselves to His action and are willing to do our part. She also gives hope to children experiencing difficulties and to parents who have a difficult child. God is with us. 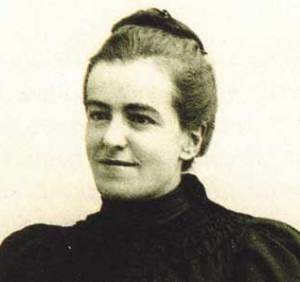 In this context we can understand why God is elevating Leonie after Therese to become a Saint. Barbara Middleton, executive pro ducer of Leonie! 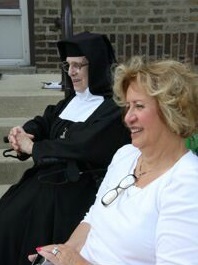 with the Superior of the Visitation Monastery in Toledo, Sister Mary Bernard Grote.